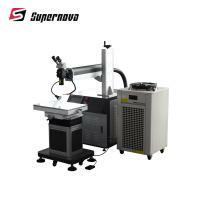 Home Companies Shenzhen Supernova Laser Equipment Co., Ltd. Factory Price!CNC YAG dental laser welder,YAG dental laser welder,CNC YAG dental laser welder for mould industry for repairing precision moulds, such as mould of digital products, mobile phone, toy, automobile and motorcycle. By applying suitable soldering wires, it is possible to fill the crack or blowholes and reuse the mould which saves production cost and improves working efficiency significantly. General laser mould welder also can be used in metal sheet stitching welding, pipe/ tube conjunction welding, and manufacturing of sensor, level switch and fine auto parts, etc. with high precision, high speed and stable performance, easy to operate. No consumables. The welding seam is deep and narrow, Fast welding speed, no black no deformation after welding,Customized is welcome! also we can design solutions and supply the most suitable your welding machine for customer according to them product. It is high efficiency machine for production! Laser control system: DMA-200W DMA-400W mold laser spot welder is under the control of double closed loop by inside improved industrial controlling micro-computer so the stability and the running ability surpass products that controlled by monolithic integrated circuit. The laser controlling system can control the power source profile precisely pre-set optimized. A: Payment<=1000USD, 100% in advance. Payment>=1000USD, 30% T/T in advance balance before shippment.